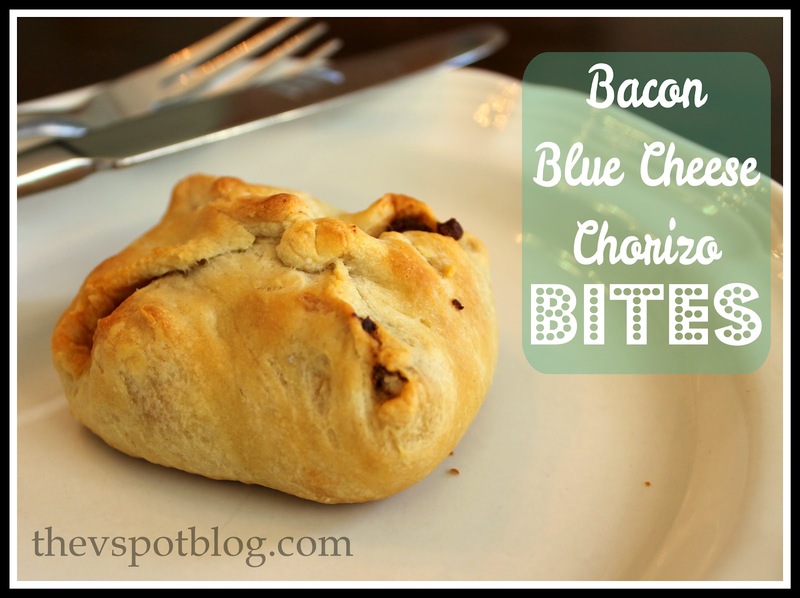 Bacon – Blue Cheese – Chorizo Bites. Anyhow, the food was amazing, and I was inspired to make these Bacon-Blue Cheese-Chorizo Bites. One of the dishes that we tasted listed the ingredients as chorizo, dates and blue cheese. Yes, yes, and yes please. When we received the dish, it had a big slice of a chorizo sausage, some grilled onions and a sprinkle of blue cheese and chopped dates. The whole thing was wrapped in a strip of crispy bacon. Sounds great, right? And it was. In theory. All of those flavors work together if you get them all in the same bite… but we didn’t. I kept mostly getting the slice of chorizo. We agreed that it would be better if everything came together in one bite. Last Friday night there was a concert in the park and we had a picnic dinner there, so I decided to give these a try at home. Here’s what I did. I used beef chorizo because I heard it was less greasy than pork. (Um, NOT. 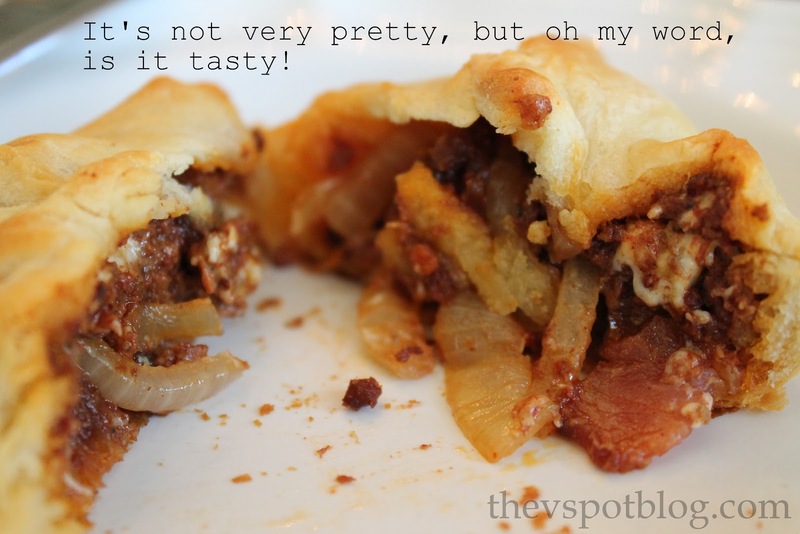 Next time I am going to try this with pork.) This stuff tastes great, but while you are cooking it, it is a greasy, disgusting, spattering mess. 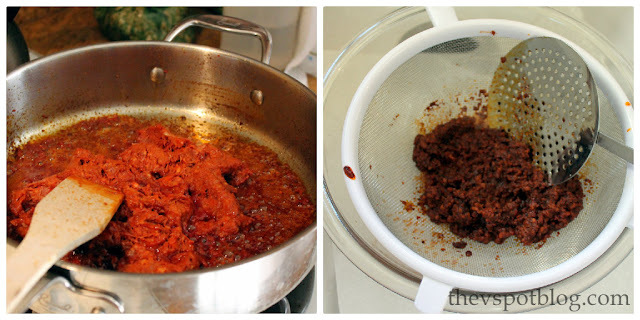 I actually drained the chorizo then let it sit in a strainer over a bowl for a while to get the majority of the grease out. If yours is looking a bit greasy, I highly recommend this step. Next I thinly sliced the onion and sauteed it in butter, letting it caramelize in the pan. 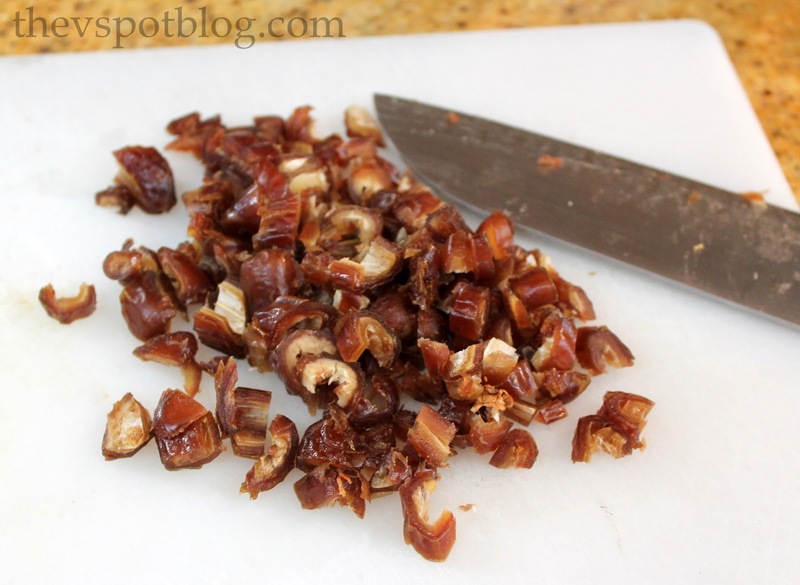 While the onions are cooking, chop up dates until you have about 1/2 – 3/4 of a cup. I think I ended up chopping up about 14 of the dates. I thought I had a full pound of bacon (16 oz) but then I looked at the package and those stinkers make you think it’s a pound, but it’s actually only 12 oz. Whatever. If you use a full pound, that’s fine. Too much bacon never hurt anybody. 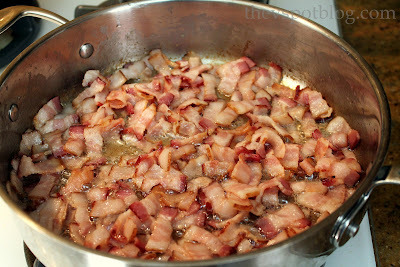 Chop the bacon and fry over medium to low heat so that the fat renders off and it is crisp without burning. 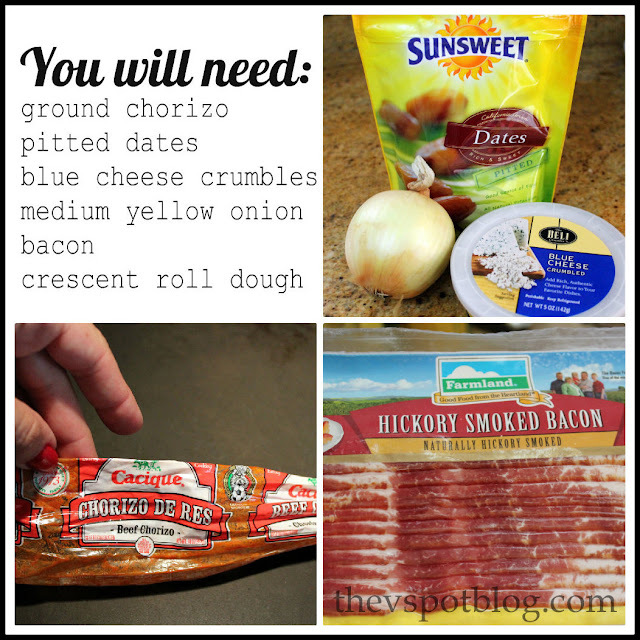 When the bacon is done add it, the chorizo, dates, onions and about 1/3 cup of the blue cheese crumbles to a bowl and mix well. You may decide to add just another sprinkling of blue cheese for good measure, but if you don’t that’s OK. Bust open 2 cans of refrigerated crescent roll dough. Instead of leaving them in the long triangle shapes, smush the seams of the triangles together so that you basically create big rectangles, then cut them in half to make squares of dough. Put about a tablespoon full of the filling on each square, and bring the corners of the dough up to the top and pinch close. They’ll look like little pillows or packages. Bake at the temperature recommended on the package of crescent dough and just keep an eye on them until they are browned. Heather mentioned that she might try her own version of the tapas restaurant’s dish. I think my Bus-Boy interpretation is pretty good, but I can’t wait to sample what the Executive Chef comes up with. I have actually made something very similar though I use golden (or the plain, old brown) raisins. Your dish looks delish!! Oh my dear, you are too cute. I miss eating tapas with you and this looks divine!! Oh I think I would love these! Not sure about my kids- but me yes. Are you freaking kidding me? These look so good. I am planning a Bacon Birthday Party for my 4 year old son – yeah seriously- and I am including this in my inspiration post. Hope you are doing good, girl! fOR LAST TWO OR THREE YEARS wE HAVE MAdE THE INSIDE MIX A DAY OR TWO BEFORE CHRISTMAS THEN i WAKE UP EARLY TO MAKE THE PILLOWS ON CHRISTMAS MORNING FOr OUR APPETIZERS WHILE OPENING PRESENTS. Sundried Tomato and Pesto Cheeseball Recipe. Easy and Yummy!